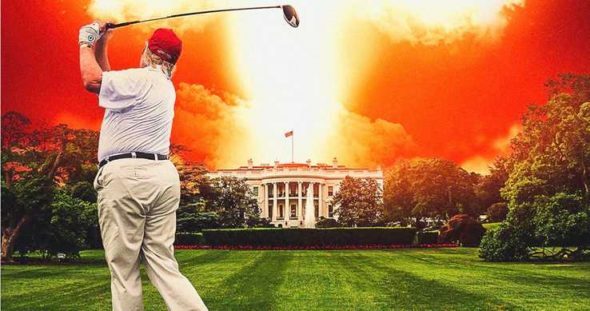 Michael Moore may set up his latest film by asking “How the F did we get here?”, but thankfully Fahrenheit 11/9 isn’t just another empty load of hand-wringing on the perils of ignoring the “economic anxiety” of the heartland. Moore has much more legitimate axes to grind, and not just about Donald Trump. In fact, after a compelling open that reminds us how sure we were that Trump was never going to win in the first place, Moore shifts his focus entirely. From the water crisis in Moore’s hometown of Flint, Michigan, to striking teachers in West Virginia to the school shooting in Parkland, Florida to a history professor at Yale and beyond, the provocateur filmmaker is after the converging forces that made Trump possible, and the dangers of continued complacency. At his worst, Moore can be self-aggrandizing and overly eager to connect certain dots. Here, outside of one needless stunt at the Michigan governor’s mansion, he’s at his most forthright and committed. He calls it on the myth of “real America,” and unveils his film’s true target is not Trump, but a government that can rule by minority. History points to some very unsettling answers. Accuse him of preaching to the choir if you want, but that’s not who Moore is most interested in reaching. Pairing lessons from the past with hope for the future, Fahrenheit 11/9 is his plea to get invested and mobilize. Wait a minute – Kristen Stewart can act?